everything excellent during our Japan tour. Thank you! 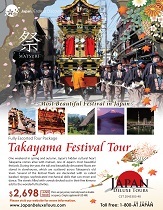 Needed more time to see Takayama Festival. Suggest just drop guides of certain say 8pm - 9pm and they can get own dinner instead of rushing back to the hotel for dinner - everything excellent during our Japan tour. Thank you! Especially fine Wifi in bus. Would highly recommend Japan Deluxe Tour.